Design games are design activities to explore various solutions to complex situations. Design games are relatively laborious to plan and organize, and a session needs to include time to learn the game. Simulation of a newspaper press and roles involved in publishing a daily paper, especially focusing on the relationship between journalists, editors and the printing people. Rethinking of work roles in department of consumer policies in Sweden. Understanding the economical environment where carpentry shops operate, organized by a trade union. Important aspect of design game is to leave some parameters of game open or incomplete: either the game is designed together with design partners (clients, end-users) in preparation sessions or the opportunity to create new ‘cards’ or change rules on their judgement is left open. The game should invoke discussions about the real realities behind the game and how those work and how they can be manipulated. 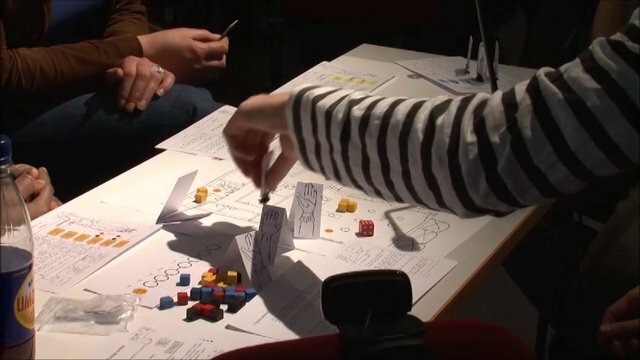 The game can be also understood as collaborative modeling activity, where designers present their initial model in the form of the game, and its limits are stressed, broken and modified by people playing the game using their experience with the actual system being modeled. There are two versions of the game, one in the Healthcare/GP context and the other in construction context. Both versions have the same basic elements, but game board, events, actions etc. vary. Example: the construction site game. Game board is based on a top-down construction drawing of a construction site, where several work areas are marked. Each player has a role, which is represented by a colored piece on game board on a certain work area and a role card in front of the player. Roles have certain pre-defined skills and capacities, which are explained in their role card. Players also have a various set of devices carried with the player, each represented by a card. Players also have a random set of ‘actions’ that are represented by separate cards that allow them to complete their work tasks or to help and teach others. There are also event cards that describe what the construction team should accomplish and various hindrances and challenges. The game is about trying to balance doing your tasks, helping others to do their tasks and learning at work. Carried devices people have allow some forms of helping or receiving help from a distance or from sources outside the game, but there are also complications: some tasks require use of hands, some devices require use of hands; some mediating tools are just inefficient compared to being present and helping. The aim for playing is to find out if the given limitations make some supposed activities impractical and if the players agree on reality of these limitations and if they find ways around them. Playing few rounds of the game should bring out improvement suggestions for the scaffolding model.